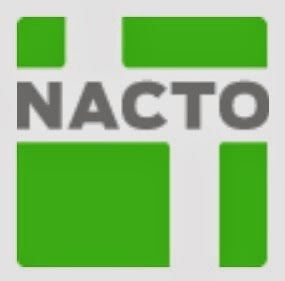 The National Association of City Transportation Officials (NACTO) and bike-share stakeholders from around North America will convene on March 2-3, 2014 for a series of critical discussions on the state and future of the bike-sharing industry in the USA and Canada. The first day of meetings will consist of a peer-to-peer exchange for cities and non-profit operators only. The second day of the forum will seek to enhance communications among vendors and their customers, forging a common mission for a bigger, more sustainable bike-share industry. Read the press release here. Parts of this two day event will be avaible as a webinar for those in the industry who can not come in person to Arlington, VA -- just outside of Washington, D.C. To connect to the webinar on Sunday, March 2, 2014, which is for municipal officials invovled with bike-share and non-profit and for-profit operators of bike-share services one must register in advance at: Day 1 Webinar. To connect to the webinar on Monday, March 3, 2014 which is for vendors and their customers and potential customers invovled with bike-share services, one must register in advance at: Day 2 Webinar. 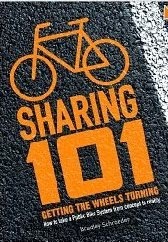 Bradley Schroeder, has just publihed a new book: Bicycle Sharing 101: Getting The Wheels Turning. If you are starting a new bike-sharing service or just need to know more, it is worth the read and to keep as a reference. 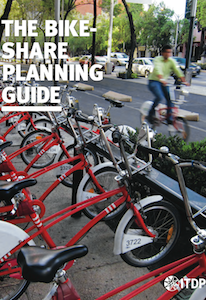 The Institute for Transportation and Development Policy (ITDP) The Bike-Sharing Planning Guide is also a good read. There are now over 685 bike-sharing cities world-wide. This makes for a good sample from which to glean some best practices and do's and don'ts. Get a copy of this Planning Guide at: www.itdp.org/library/publications/details/the-bike-share-planning-guide. Keep in touch with The Bike-sharing World with The Bike-sharing World Map. It is the premiere resource for information on cities with bike-sharing. The easy web address for viewing the map is www.bikesharingworld.com. On March 2 - 3, 2014, leaders drawn from across North America’s burgeoning bike-share industry will convene for a two-day summit on the state and future of bike-share. The meeting, which follows a 2013 roundtable of bike-share system owners convened by the National Association of City Transportation Officials (NACTO) in Denver last September, will gather industry leaders at a critical moment for bike-sharing in the United States. While 2013 saw bike-share systems launch in New York, Chicago, San Francisco, and several smaller cities, the industry has had growing pains of late. The declaration of bankruptcy by Public Bike System Co., one of North America’s largest bike-share vendors, has spurred cities and suppliers around the nation to come together to better understand how we can ensure the sustainability and success of bike-sharing going forward. The two-day meeting will be broken into several targeted dialogues, some consisting of only cities and system owners and others hosted by vendors to speak directly to their customers about their latest products, initiatives, and efforts to improve system operations and communications. Industry leaders will discuss how to achieve common goals, such as increasing system usage and revenue, and improving the overall bike-share user experience. This meeting is a positive step towards the formation of a bike-share industry partnership aimed at accelerating innovation and facilitating communication among bike share stakeholders. Bike-share vendors interested in participating should contact Bill Dossett of Nice Ride Minnesota (bdossett@niceridemn.org, 612-436-2074). Cities [and counties] interested in participating should contact David Vega-Barachowitz of NACTO (david@nacto.org, 646-628-3337). I'll be there in my role as the program manager for Arlington County, Virginia's portion of Capital Bikeshare and encourage other jurisdictions with bike-share services and bike-share equipment vendors and operators to join us. This event will be ground-breaking for our fledgling industry. I hope to see you there!